2 Plans, 12 weeks of total training designed to prepare new USMC Officers for the rigors of The Basic School, and during the final 2 months of TBS, prepare them for IOC and the CET. TBS Plan includes specific programming/progression for the graded events: PFT, CFT, Double O-Course, E-Course. IOC Plan sessions are designed to be completed between field events during the last 2 months of TBS to prepare athletes for the CET and IOC. The two plans in this packet come with the 190+ Plans included with an Athlete’s Subscription. 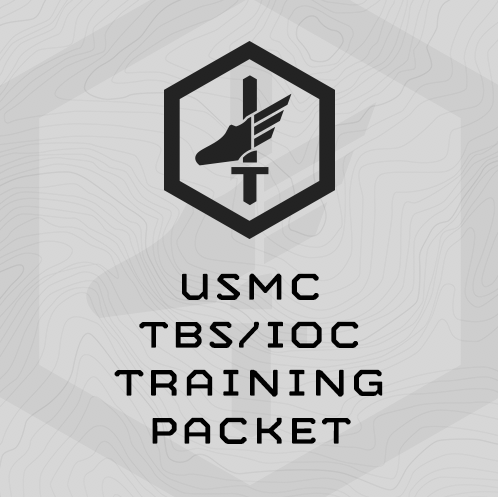 The USMC TBS/IOC Training Packet consists of two plans intended for newly commissioned Marine Corps officers preparing for the physical demands of the The Basic School and the Infantry Officer Course. The TBS plan is six weeks, with training sessions 6x days/week. It should be completed six weeks directly before the TBS check-in date. Increase overall strength and durability for the duration of the course. The IOC plan consists of 30x training sessions which should be completed during the final two months of TBS. The plan trains long endurance and obstacle course fitness at light loads in preparation for the Combat Endurance Test (CET), rucking at increasing heavy loads/distance, tactical work capacity, and increase strength and durability. We understand the final two months of TBS consists of multiple field events – do the training sessions in between field events. The sessions should be completed sequentially… don’t skip around. The following program is designed to prepare an athlete for successful completion of the physical requirements associated with the Marine Corps – The Basic School. It is an intense 6-week program designed to be employed exactly 6 weeks before your check-in date. It’s designed specifically to improve results on graded events at TBS as well as overall physical performance. The program is progressed to get harder as you go along. Do the sessions in the order written. Don’t skip ahead. If you’re less than 6 weeks away from TBS, start at Session 1 and progress as far through the program as you can. Optional: If you have access to USMC O-Course, use it for the Tuesday sessions. If not, use our substitute listed in the programming. Due to the complexity of the USMC CFT MANUF event we think it is impractical to require you to set-up and complete the entire MANUF multiple times throughout training. Instead we have designed a simplified MANUF assessment which we have substituted and will use to progress your training. The simplified course allows you to train for each event in the MANUF without the burden of a complicated set-up. We call it the Devil Dog Assessment. While the Devil Dog Assessment tests all the same physical aspects as the actual MANUF event, we still recommend that you complete at least one trial run of the USMC CFT MANUF course prior to your test. Being familiar with the actual MANUF course will all you to better transfer the skills you gain during this training plan. Your training for the USMC CFT will be divided into the three separate components: (1) MTC, (2) AL and (3) MANUF. (1) Training for the MTC will consist primarily of speed endurance runs of 220 yard and 440 yards. (2) Training for the AL will consist primarily of upper body strength endurance events. (3) Training for the MANUF will consist primarily of sprints, agility drills, high crawls, modified high crawls, dragging objects, carrying objects and body weight exercises. Note: We will not train for the grenade toss portion of the MANUF event. If an athlete wishes to train for this event they will need to prepare on their own. The assessment is actually very simple. Watch our video HERE. To complete the assessment all you will need is: 2x cones (to mark the 25 yard course), a partner (or dummy or 80# sandbag) and 2x 30# Ammo Cans or Dumbbells. The run intervals work off of your most recent PFT and 6-mile run results. You can find the Links to the Calculators under FAQs at the bottom of this overview. Approximately 60 minutes. The Saturday ruck will take 60 minute to 120 minutes. My gym doesn’t have sandbags. What should I do? Make one and take it with you when you train … a sandbag (60# for women, 80# for men) is required for this program. We sell sandbags at mtntactical.com, other venders sell them, and you can make your own. Be resourceful. Where can I find the Running Calculator? The USMC Infantry Officer Course (IOC) Training Plan is a 30 session cycle designed specifically to prepare the athlete for the physical requirements of the Combat Endurance Test (CET) and follow on training at IOC. The plan is designed to be completed during the final 2 months of The Basic School (TBS). We understand that this period has multiple field events in which you won’t be able to train. Use these sessions when you can. Train smart – field events have priority. The plan includes classic barbell strength as well as body weight strength endurance. Multiple endurance events using the facilities available at Camp Barrett, Quantico where IOC training will take place to include the USMC O-Course and Endurance Course. TLU Strength with focus on Power Cleans, Front Squat, Military Press, Hang Squat Clean, Bench Press, and Box Squat . This total body strength frequently assesses 1RM’s and trains at heavy, moderate, and light loads through the cycle. This plan includes the MTI Tactical Athlete Work Capacity Assessment. below are details on how to conduct the assessment. This is a simple and straight forward assessment specific to the work capacity and movement requirements of tactical athletes. 1x Rep = 1x 25m length, so a round trip = 2x Reps. Only full lengths count. Athlete starts on the ground prone, and must drop to the ground prone at each turn around. Tally the total reps for each round. A sum of reps from all 3 rounds is the athlete’s final score. The objective of the rucking progression is to ensure you are prepared to carry the heavy loads over the rolling terrain of the Camp Barrett training areas. You will begin at 65#, and work up to 85#. Use trails (not hardball) as much as possible. IOC has no ruck-run events, but does include many miles of walking with a very heavy pack. Maintain a 15 minute per mile rucking pace. This is fast walking, not running. For lightly loaded running, you’ll work up to completing the Endurance Course (E-Course) twice. This should be completed at a moderate pace. Moderate pace means comfortable, but not easy. We want you to be able to run long distances in preparation for the CET. You’ll work up to carrying a 20# load on top of your LBV. Complete all obstacle course iterations in your LBV to gain confidence in getting over obstacles with a awkward load around your mid-section. Be in control – don’t go so fast that you can not maintain your balance. Ensure you have medical personnel on stand-by. How long do the training sessions last? Training sessions are designed to last 60-75 minutes. Endurance events may take up to 2 hours. Work briskly, not frantically. Keep moving and work steady through the circuit. These sessions do not have to follow a standard Monday to Friday schedule. You can have multiple days between training sessions if in the field or otherwise occupied with training at The Basic School. Complete the sessions in order – don’t skip around. Make one and take it to the gym when you train … a sandbag is required for this program. We sell sandbags at mtntactical.com, other venders sell them, and you can make your own. Be resourceful. (2) 10 Rounds every 60 sec. (2) 6 Rounds every 75 sec. Maintain a 15min/mile or faster pace…. fast walking, don’t run. (4) Max Reps Pushups in 2 min. "I wanted to let you know that I graduated from IOC this past Saturday and I owe you and your staff a huge thank you for your IOC and CET plans. I was the smallest guy to graduate (5'7", 150-160 lbs throughout the course) but I felt physically and mentally prepared every day, and I contribute that to simply being used to having to push way past my comfort zone during your workouts. The day of the CET I kept thinking to myself "my body has been here before a dozen times," especially when we were around the O-Course, and that enabled me to stay focused mentally - a pattern that would repeat itself throughout the rest of the course as well. Your programming's focus on chassis integrity and lower body strength were invaluable for the many miles of heavy hiking, and more important than allowing me to perform, it allowed me to remain injury free while so many others got hurt. Y'all do great work and make a great product, thanks again."